The huge game world of Fallout 4 is full of Easter Eggs, references and allusions to various films, series and other products of pop culture. For fans of films, TV series and games - like Good Will Hunting, Jaws, Walking Dead and Cheers and the predecessor of Fallout 4, the search for Easter Eggs is worthwhile. We have collected 10 best Easter Eggs for you, reference to movies, TV series and Fallout 3 and also show you where you can find them. 1. Toy Story 3 - Location: At various points in the wasteland. Do you remember the clapping monkey from Toy Story 3? An allusion to this awaits you in the form of a monkey, the noise makes with pool, once you are in its proximity. 2. 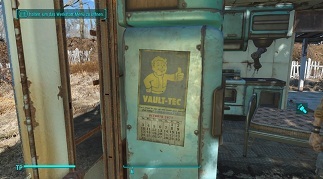 Vault Tec Telephone Number (1-888-4) - Location: In a house in settlement in Sanctuary you will find a refrigerator with a calendar. There you will see the phone number of Vault-Tec. 3. Sons of Anarchy - Location: AADTSL Station in a terminal near the prison cells. Here you will find the name of the convict Opie Winston / Ryan Hurst, a character of the series. 4. Fallout 3 Secret Door - Location: Located close to the Suffolk Country Charter School in a Westland. Here there is a door that reveals only one wall with an inscription after opening. You could find this Secret Door in Fallout 3. 5. Good Will Hunting - Location: CIT rotunda above the Institute. Search for a skeleton next to a chalkboard. This scene is an allusion to Will Hunting (Matt Damon). 6. Jaws - Location: Near the wreck of the USS Riptide. In the stranded boat you find a dead monster and a skeleton that is equipped with Quint. 7. Cheers - Location: Cheers bar near the Boston Common park. There you can see even the protagonists of the series. 8. Blade Runner - Location: Mass Fusion refuge on the roof. The final scene in the movie with Harrison Ford. Here takes a synth on the role of Roy. 9. Walking Dead - Location: In the Church left from the hospital Kendall you find the character Gabriel Stokes. 10. Lone Wanderer - Location: On the upper deck of the parking garage near the Super Duper Mart. Here is a motorcycle with the name "Lone Wanderer". This name was the character of Fallout 3.